This resume sample shows how you can highlight your patient-care and administrative skills to advance your career in healthcare. As an industry, it doesn't get much hotter than healthcare, which is great news for you as a medical assistant looking for a great new job. To get noticed for top medical assistant jobs, be sure to highlight your patient-care and administrative skills on your resume. 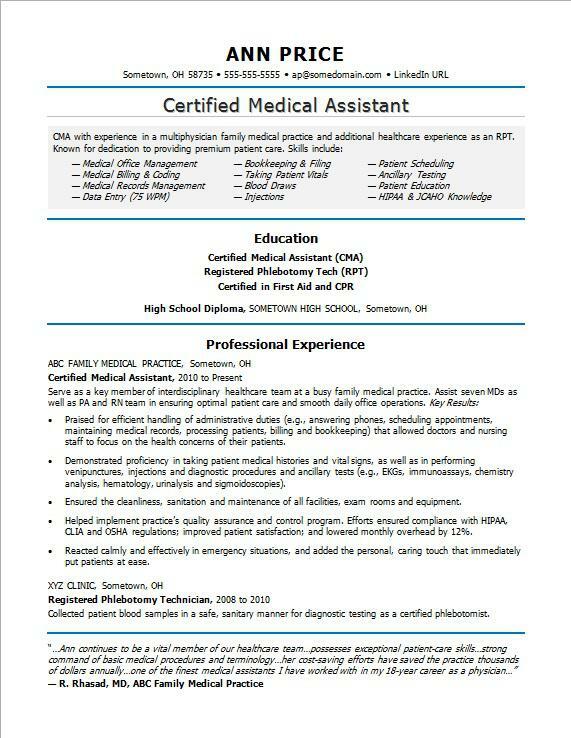 View the sample resume for a medical assistant below, and download the medical assistant resume template in Word. Jobs for medical assistants are projected to grow by 29% (or 183,900 jobs) from 2016 through 2026, which is much faster than average, according to the Bureau of Labor Statistics (BLS). You'll find the highest level of employment for this job in the following states: California, Texas, Florida, Pennsylvania, and New York; and in the following metropolitan areas: Los Angeles, New York City, Dallas, Houston, and Phoenix. As a medical assistant, you can expect to earn a median wage of $32,480 per year, or $15.61 per hour, according to the BLS. Praised for efficient handling of administrative duties (e.g., answering phones, scheduling appointments, maintaining medical records, processing patients, billing and bookkeeping) that allowed doctors and nursing staff to focus on the health concerns of their patients. Demonstrated proficiency in taking patient medical histories and vital signs, as well as in performing venipunctures, injections and diagnostic procedures and ancillary tests (e.g., EKGs, immunoassays, chemistry analysis, hematology, urinalysis and sigmoidoscopies). Helped implement practice’s quality assurance and control program. Efforts ensured compliance with HIPAA, CLIA and OSHA regulations; improved patient satisfaction; and lowered monthly overhead by 12%. Health care is a field that is growing so fast, employers can hardly keep up. That's great news for you. Whether you're hoping to work in a teaching hospital, mid-size clinic, or bustling private practice, your resume will need to pass the scrutiny of hiring managers who are looking to hire the brightest medical assistants. Could you use some help refining your resume? Get a free resume evaluation today from the experts at Monster's Resume Writing Service. You'll get detailed feedback in two business days, including a review of your resume's appearance and content, and a prediction of a recruiter's first impression. Let someone else do the assisting for a change.